The 2013 Honda Ridgeline is available at one of the leading Honda dealerships near Monroe, Middletown Honda. It has become synonymous with high performance, efficiency, and ease of use. The base Ridgeline is available for an MSRP of $29,350,* which is a pretty attractive price point for a pickup these days. That said, there are quite a few competing trucks out there, like the 2013 Toyota Tacoma. Let’s see how they stack up! Honda’s new pickup and Tacoma have similar engines, and yet the Ridgeline offers drivers more power. 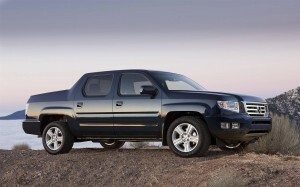 An example of the superiority of Honda engineering, their truck offers 250 hp compared to the Tacoma’s 236 hp. This difference may seem small but it translates into a noticeable drop in power. The Ridgeline also has standard rear locking differential, a rear stabilizer bar, and a turning diameter two inches wider than the Tacoma to make sure you can clear the the way when you’re headed to a job site. The Ridgeline also beats out the Tacoma when it comes to interior design options. It comes with standard cruise control, wheel mounted controls, a rearview camera, a sliding electronic power rear window, a multi-function remote, and adjustable front seat height. All of these options are either optional or missing from the Tacoma. Is it any shock the Ridegeline is flying off the lots? Bigger isn’t always better, but when it comes to pickup trucks it often helps. The Ridgeline offers more room in all interior dimensions measurements, including headroom, leg room, and hip room. It is also a heavier truck, meaning it will be easier to drive in the winter or through bad conditions. We think it’s pretty clear that the Ridgeline is the pickup of choice here, and you’ll be happy with all that you get, especially if you were considering the Tacoma! If the 2013 Honda Ridgeline sounds like a great investment, why not come on down and test drive one at Middletown Honda. We have an excellent selection of new vehicles, including the Ridgeline, that we just can’t wait to show you. Come visit our Honda dealership in Middletown today. We’re just a short drive away from Monroe, and we can’t wait to serve you!